The NuAire NU-8700 Water Jacketed CO2 Incubator offers stable, uniform in-vitro environments in a dual stacked space saving configuration. This tissue culture incubator is designed for optimal cell growth by focusing on precise temperature control and humidity control, as well as maintaining a sterile environment, and reliable functioning. The extra-large, 20 Gallon, water jacketed walls of this CO2 Incubator serve several functions. The jacket provides insulation from external temperature fluctuations from one of natures best heat sinks, overall temperature uniformity of ±0.2°C and cabinet stability for when you’re growing vibration sensitive cells. This cell culture incubator maintains a near body temperature making it ideal for the storage and preservation of embryos, gametes and animal tissue cell cultures. The NuAire NU-8700 Water Jacketed CO2 Incubator is microprocessor controlled for precisely maintained chamber environments, while striving to be user friendly. The brightly lit LED screen shows users control parameters and allows them to set up quickly from a three button touch key pad. This CO2 incubator also features an IR CO2 monitor that’s independently measure from humidity and temperature. This lab incubator is sturdily constructed from all stainless steel both internally and externally. The interior chamber of this 13. 28 cu ft incubator features coved corners for an easily cleanable surface and no grooves to hold contaminants, as well as shelving that can be removed without tools and autoclaved. This water jacketed incubator offers constant contamination control with the use of a HEPA filtration system, that maintains a ISO class 5 cleanroom standard air quality. The temperature range of this cell culture incubator is 18˚C to 55˚C (5˚C Above Ambient to 30˚C Ambient Max), with a humidity range of between 10% to 95% relative humidity. 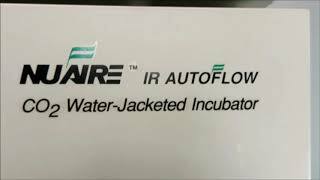 25½" x 27" x 75½"
These NuAire Autoflow NU-8700 Water Jacket CO2 Incubators have been thoroughly inspected and come with recent calibration reports. All of our lab equipment comes backed with our standard warranty. Should you have any questions, please don't hesitate to contact us.